We want to give something back! That's why we contribute towards this grove with every Pangarden Game sold! Planting trees is imperative for all our lifes and all our survival, so we very much enjoy this opportunity to plant trees for life. 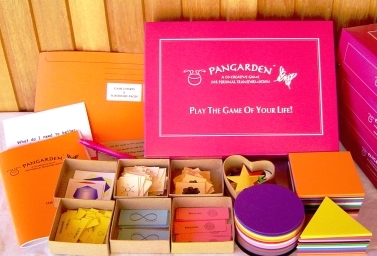 PANGARDEN is a supportive and empowering co-creative constellation game from Findhorn in Scotland, to manifest blueprints for positive new realities and gain fresh perspectives. Working with Pan, Devas and Nature Spirits is an integral part of how we do business. It is also how we created the Pangarden Game! By playing the game you can learn how to involve these beings to help you work things out in your life. All our business decision we make by consciously including Nature in our decision making process... How we do this? It's easy! We use Co-Ceative Science and the Perelandra Soil-less Garden Companion. If you are interested in doing the same, look at these books for a start. If you have questions about this, you are welcome to ask us for more info. With this wonderful game, you allow your intuition and co-creative skills to 'flip the switch' on situations in your life. Choosing from the specific coloured foam-rubber shapes, simply lay out the situation that is troubling you or which you have questions about. As you gain insights, new perspectives and understanding through the special card-sets, shift-processes are triggered, enabling positive new realities to form.